FOXBOROUGH – After all these years, Raider fans finally know how Patriot fans feel. You never want to see a classic football game, and think to yourself that this game turned on a bad official’s call. Officials are like offensive linemen, in that they have done their job when you don’t notice that they’re there. Just like you only know of an offensive lineman when he’s called for holding, you only remember an official for a controversial call. Richie Powers got his two seconds in, and a fan got his fist in also. Larry Barnett still has no clue as to what batter interference is. Don Koharski would be a great salesman for Dunkin’ Donuts or Krispy Kreme. None of these gentlemen are known for their level of officiating. And then there’s Ben Dreith, who is probably the only man Barnett could run against in Boston for mayor and win. Earlier this week, Dreith was contacted by the Boston Globe and foolishly re-asserted his claim on the most damaging penalty ever levied against the Patriots in franchise history. Even though the CBS postgame show ran a clip of the play in 1976 against Oakland which clearly shows that Raymond Hamilton’s contact on Ken Stabler was incidental and legal, Dreith still insists that there was roughing. If you think about it, what’s Dreith going to say? That he was wrong? Okay, Oakland, start making your Walt Coleman voodoo dolls and dart boards. With 1:43 left in the fourth quarter, and the Raiders up 13-10, the Patriots had a first down at the Oakland 42. Charles Woodson came charging in on a corner blitz, and was bearing down on Tom Brady’s backside. Brady’s arm went forward, but was still clutching the ball. Woodson then hacked Brady on the arm, and the ball fell out. Greg Biekert recovered, and the Patriots, out of timeouts, were dead as a doornail. But before you reached into your pockets for your car keys, Coleman announced that the play was under review. Replays clearly showed that Brady held the ball as his arm was going forward. Woodson caused the fumble. No question, it’s a fumble. But Coleman came out and delivered to the Patriots a gift from someone up in the hereafter. Maybe Billy Sullivan sent down a lightning bolt and struck Coleman right in the brain. But Coleman came away from the replay screen and gave the Patriots a gift that has been 25 years in the making. Coleman ruled incomplete pass, in that Brady’s arm was going forward when Woodson hit him. The sellout crowd went into outer space. Jon Gruden also went into outer space. Given a new life, Brady also went into outer space. He hit David Patten for 14 yards to get Adam Vinatieri into field goal range. Vinatieri line-drived a 45-yard field goal to tie the game. And in overtime, Brady hit eight straight passes to bring the Patriots to the Oakland 22. Antowain Smith then went into outer space, running the next four plays to get the Patriots inside the Oakland 10. Brady took a knee, and Vinatieri sent everyone on the planet who swears allegiance to the Patriots into outer space. Vinatieri’s 23-yard field goal gave the Patriots a 16-13 overtime win, and gained their third-ever berth in the AFC Championship Game next weekend. On a Currier and Ives evening where the field was snow white all game long, the end game celebration with all the Patriots whooping it up on the field was like a snowball fight in someone’s backyard. Lonie Paxton was so happy that he flopped down on the ground and made a snow angel. The Patriots continued some patterns Saturday night that have defined this amazing season. Brady looked all evening like the second Jets game, where he stunk out the joint in the first half, but looked like Johnny Unitas or John Elway in the second half. The Patriots brought their “C” game tonight, showing all the signs of rust and dust all game long, yet had just enough to win the game. And the call that went in favor of the Patriots at the end of regulation was reminiscent of the Patten play at Buffalo a few weeks back. The Raiders, given little chance to succeed amidst freezing cold and a constant snowstorm all game long, stood their ground all game long. The Raider defensive front seven dominated the line of scrimmage most all game long. With one of the keys to winning being Smith to have a great game, Oakland held the bruising Patriot back to 65 yards and a 3.3 average. The only chance the Patriots had in this game was with Brady and the airwaves. Ironically, the Patriots had wanted to avoid any scenario which Brady alone had to win the game, but win it he did, with help from Coleman. Brady had a putrid first half, hitting on only 6 of 13 passes for 74 yards and one pick. 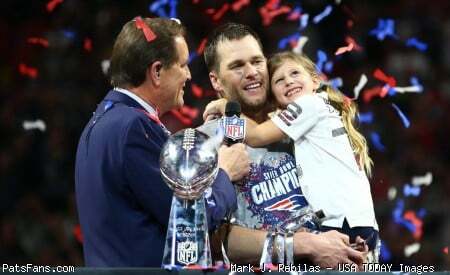 He finished with 32 of 52 for 312 yards, and became the first Patriot quarterback in franchise history to score a rushing touchdown in the postseason with a 6-yard scoring gallop midway through the fourth quarter. Rich Gannon also enjoyed a good night, which was not expected in this kind of weather. Gannon hit 17 of 31 passes, 14 of those passes going to Tim Brown, Jerry Rice and Charlie Garner. The Patriots were able to settle into their “bend but don’t break” defense and were able to sustain Gannon’s sharp passing attack. But the Raiders did dent the Patriots for a red zone touchdown, as Gannon was able to launch a 13-yard scoring toss to James Jett early in the second quarter. Overall, the Patriot defense made the plays that they had to make. It was just a matter of time until the offense, in a moribund state most all night long, finally woke up in the fourth quarter. If you take away Coleman’s earth-shattering call, the game came down to a few key plays and a matter of inches. As the game neared the two-minute mark of regulation, the Raiders had induced the Patriots to spend all their timeouts. Facing third and one at their own 44 just before the two-minute warning, the Raiders sent Zack Crockett up the middle, and Tedi Bruschi stuffed him for no gain. After the measurement, the Raiders were two chain links short. The Raiders punted, and the Patriots took off on their game-tying drive. In overtime, the Patriots had fourth down and three at the Raider 27. Vinatieri had a 44-yarder right here. But Bill Belichick opted to go for it, and Brady found Patten on a quick slant out literally right on the first down stripe. Patten made the grab, and the Patriot drive was barely kept alive. Six plays later, the game was over. Brady and Vinatieri will get the major props, but Patten and Jermaine Wiggins were real keys to this win. Wiggins, in what was undeniably his best game as a Patriot, led the team with ten catches. On two of those catches, he leaped over defenders and dove for two or three extra yards. Patten had eight grabs, which was critical with Woodson smothering Troy Brown all game long. The two men were involved in one of the wackier plays of the game. On their fourth quarter touchdown drive, the Patriots had first down at the Raider 20. Brady looked for Patten at the right sideline and fired a bullet at him. The ball hit him right in the hands, and popped out. Wiggins was right there, caught it out of the air, and stayed in bounds. It was just a four-yard gain, but Brady took it in for the score three plays later. The game will go down as a New England classic, with inhuman weather conditions, huge controversy and a thrilling finish. It will remind Boston fans of the 1975 World Series, except Coleman’s call went for the home team instead of against. And Vinatieri’s field goal was Fisk-esque in importance and excitement. And Foxborough Stadium, which was supposed to have been demolished nearly a month ago, may yet live to see one more game. If Baltimore beats Pittsburgh on Sunday, there will be one, ultimate, absolute, final game at what used to be Schaefer Stadium. It’s becoming The Stadium That You Simply Can’t Kill. If nothing else, Foxborough Stadium is certainly having some wild final days. The huge win over Miami to all but clinch the division is now followed by a snow bowl for the ages. 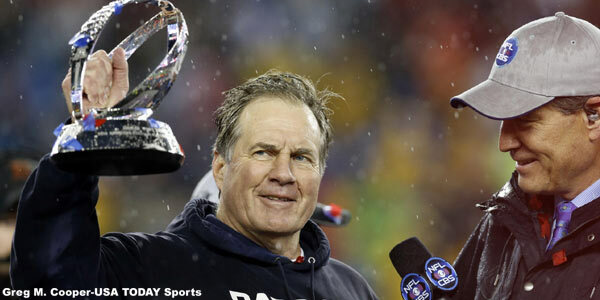 One has to wonder what the football Gods have in store for the Patriots if the Ravens should win Sunday. But if the Steelers win, Foxborough Stadium will be ready to be razed. Finally. The Patriots must have their football chops back in full force now. There will be no stale team next week against whichever AFC Central opponent they draw. The hitting and hurting came back to the Patriots in full force tonight in the freezing cold, and the last thing the Patriots would need next week would be still another bye week. Patriot Nation can now settle down, watch Sunday’s Steelers-Ravens tilt and find out who the home towners will play next week. As for the Raiders, they will chew on this one for quite a while. They played well enough to win the game. They played better in the snow and cold than anyone up here ever imagined. But they still lost the game, and you have to admit that the Raiders got jobbed. But as a Patriot fan, you just think about Ben Dreith and tell your Raider fan buddies that they will simply have to move on and get over it. However, if you’re not over December 18, 1976, then you have an idea of what Raider Nation is now in for. This entry was posted in Uncategorized on January 20, 2002 by Bob George.